Winter is a time for us all to get hunkered down in the comfort and warmth of our home. We tend to eat dishes that warm us up and make us feel full and happy. With spring just around the corner lets celebrate the dishes that will energize and excite us for the upcoming weeks of spring. The edamame bean is a immature soybean that comes from a pod, much like peas but are a bit different. The name itself literally means "steam bean" in Japanese. It's most commonly found in East Asia cuisines and is usually boiled or steamed and severed with salt. The earliest documentation of the bean dates back to 1275 in Japan where a monk wrote about the small treat. Next in 1406 during the Ming dynasty in China, edamame were eaten during the outbreaks of famine and were part of the survival. Not only is it a tasty treat but it also contains energy, protein, and fiber along with various amino acids. The bean also helps promote a healthy digestion system which connects to it being a great source of fiber. Edamame can not only help promote a healthy diet but it’s also a good source of Vietnams and iron. It's a light, refreshing appetizer that is a great way to start off your meal at any restaurant. So, if you are looking to get your body in tune with nature and ready to spring forward why not start your meal at Windchimes with some yummy edamame! It's that time of the season when we yearn for warm comforting food that not only fills our bellies but is also healthy and nutritious. The House Sizzling Noodle is a fantastic cold weather dish and an amazing show of sizzle, crackles, and steam as it is brought out in a piping hot, cast iron skillet where the vegetables and meats finish cooking right in front of you. The House Sizzling noodle is a medley of vegetables and chicken, beef, and shrimp laid over a bed of fried rice noodles. The brown sauce is a a perfect blend of spices to create a balanced, delicious, and comforting food. It's not only appetizing but an experience. I suggest trying the House Sizzling Noodle on your next visit to Windchimes and experience this tasty dish. Bok Choy is an amazing vegetable not only is it tasty but it is packed with vitamins and anti-cancer properties. Bok Choy is a cruciferous vegetable along with kale, brussel sprouts, cabbage, turnips and collard greens. Bok Choy has potassium, Vitamin A, calcium, Vitamin b-6, magnesium, iron, and vitamin C. Cruciferous vegetables have glucosinolates. This Glucosinolate is a sulfer containing compound and benefits humans in a variety of ways.These are sulfur-containing compounds that have been found to benefit human health in a variety of ways. Why am I not eating Bok Choy everyday? in fact why am I not eating Windchimes everyday??! Come into Windchimes and feast on one of our Szechuan dishes which are served with your choice of protein and Bok Choy. And look at that... It's Lunch time already! If you are a curry lover than this Yellow Curry dish is a perfect lunch or dinner choice to quench that exotic palate. Yellow curry has a base of all those yummy spices of turmeric, cumin, coriander, garlic, salt, bay, and fenugreek. These spices, mixed with a coconut based sauce, creates a medley of flavors that are out of this world. Fresh vegetables and your choice of protein add the texture and energy to this dish. So come on in and delve into the World of Curry by experiencing the Yellow Curry! 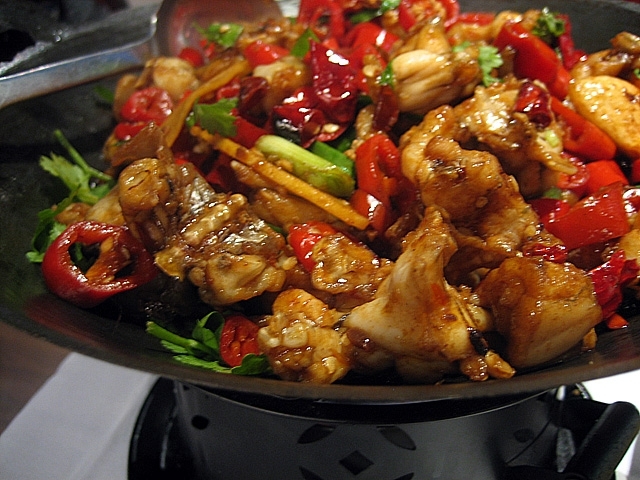 Windchimes Chinese: Where Flavors Mix and Meld to Perfection!